After 883 years, a Cistercian monastery in western Germany is scheduled to close due to a shortage of monks. Financial costs and the small number of monks there led to the decision. After almost 900 years since its founding by French Abbot Bernhard of Clairvaux in 1134, the Cistercian Himmerod Abbey in western Germany will soon close its doors for good. The decision was made by the Mehrerau Congregation, a worldwide association of Cistercian monasteries based near Salzburg, Austria. The abbey is a direct subordinate of the Holy See and not part of the Archdiocese of Salzburg. Himmerod Abbey narrowly avoided bankruptcy six years ago, but high maintenance costs and dwindling numbers of religious have made it impossible to keep the site open. 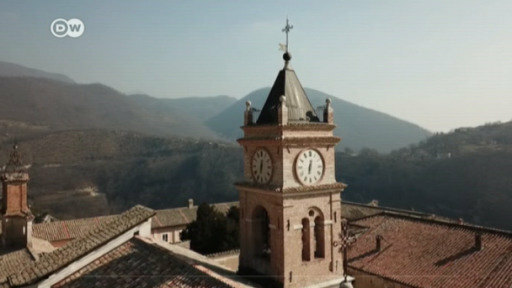 Abbot Johannes, who heads the monastery, said the financial burden of operating Himmerod, which currently only has six monks, led to the decision. The abbey will now be transferred into the possession of the Diocese of Trier, which has yet to say what it plans to do with the space. The abbot said the six monks currently residing at Himmerod, which is in the German Eifel region, will be given the opportunity to move to the monastery of their choice. The fate of others working at the site, however, remains unclear. The abbot said despite the painful decision to close the site, he remains optimistic that it will not simply be shuttered: "Himmerod will remain a spiritual site. The walls have retained this history. I am telling you: There is no way to destroy this spiritual place, which has attracted people for centuries. I am certain people will continue to come here." He also voiced hope that the abbey's bookshop, plant nursery and fishery, which it leases out, would continue to operate in the future. The Cistercian order was founded in 1098 in reaction to what was seen as the abandonment of the virtues of humility by the leading monastic order of the time at Cluny. Its founders sought a simpler life, and the architecture of the order's abbeys became renowned for its elegance. The order expanded greatly under Bernard of Clairvaux, spreading across Europe and into Scandinavia and the British Isles. That spread continued, yet the Protestant Reformation signaled a sharp decline and the revolutions of the 18th century almost wiped out the order completely. Steve Bannon, former chief strategist in Donald Trump's White House, is helping to set up a training center for nationalists. Its founder wants it to become "the global headquarters in the fight to defend the Judeo-Christian base of Western civilization."